Have you tried this yet? I'd definitely be interested in getting a couple of their pens if they fit Jowo #5 nibs. Everything I have ever received from FPR has been fantastic. The Himalayan continues to impress me & the Triveni Jr. is just just a great little converter pen. Try either with a Creaper nib & their ebonite feed...You won't be disappointed! The Himalayan will keep up a little better with ink demand because of its filling system. Edited by Bordeaux146, 31 August 2017 - 22:27. Do they fit #5 Jowo nibs though? I've been eyeing some of the Franklin Christoph nib grinds and looking for something affordable yet still good quality to put them in. My Himalayan does not have a threaded nib holder so you would have to use only the Franklin Christoph (FC) nib. The FPR feeds & sections are round on my pens. It will be a couple more weeks before I can answer that question from personal experience, as my parents are going to include the FPR pens in a box they are shipping to me and it will take a while to arrive. According to post #21 above, the JoWo #5s should fit on these pens. 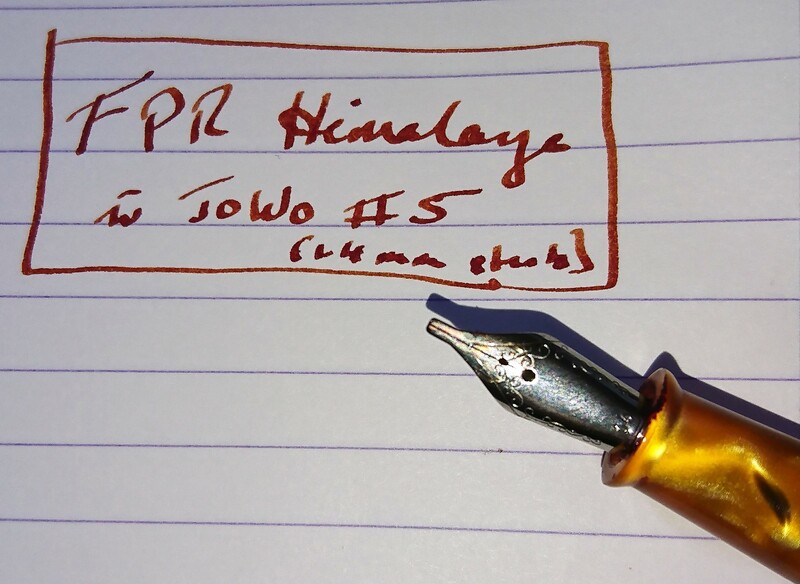 Please forgive the rough quality - I just removed a #5 JoWo nib from its housing and inserted it into one of my currently-inked FPR pens (a Himalaya Saffron). It seems a pretty snug fit, though I haven't had it in there for any length of time! Extremely helpful photo, thanks so much! I'm really looking forward to trying my Himalaya out with a JoWo #5 when it gets here. I don't know how I missed it before, but I just discovered that JoWo #5 nibs fit perfectly in the Italix Parson's Essential. Judging by the engraving on the nib, I believe the Italix nibs are JoWo #5 anyway, but can't be certain. Until my parents send my FPR pens to me, my Fpnibs JoWo #5 architect nib has found a nice home in my Parson's Essential which had just been sitting in the pen case untouched for months. The nib and feed just seem to be made for each other with amazing flow. I finally got my pens today! I can confirm all that's been said before about the JoWo #5 nibs fitting in the FPR Himalaya and Guru. The smaller Jinhao nibs also fit these pens. I can also confirm the previous warning about how hard it is to get the nib and feed out of the free FRP Muft pen. Thanks for that warning I was able to very carefully use some gripping material and pull both out. The nib that came on the pen was absolutely awful so I replaced it with an FPR flex nib and it's a tight but perfect fit. I noticed that the FPR nibs are thicker than JoWo #5 nibs. As a result, the JoWo nibs will fit just a tad loose in the FPR pen, but the FPR nibs really require some jamming to get into pens like Jinhaos. Pretty nice quality for 25 bucks...What do you think? I'm thinking it's about the best deal in ebonite anywhere. Edited by Bordeaux146, 11 November 2017 - 14:24. I wholeheartedly agree, especially considering I got these pens when there was a special sale going on! I got the full ebonite Himalaya and am surprised at how light and comfortable it is. The Guru is also a classy design that reminds me of vintage German piston fillers. The option to upgrade the feed to a wetter one for flex writing is another amazing deal. My Guru is now sporting a vintage German flex nib and is the performing fabulously with no railroading at fast full flex. (JoWos are somehow not available for end users in Germany!). I got #5 replacement nibs from Gullor that are suppposed to fit in Jinhao 250/301/500/5099/8802/9009/5000 pens. The #6 nibs were promised to fit in Jinhao 159/450/750. So these Models should be interchangeable. The Gullor nibs fitted well (respectively), but they are just as thin and hard nails as the Jinhaos. I have four Jinhao 250; with two of them the nib section was loose and slid out when I inserted a cartridge. Instead of the Jinhao nib section I could insert a Bock 160 076 triple and it fit better in than the Jinhao one! The cap of the 250 has enough room for the rather broad 160 076 Bock nib. Encouraged by this I took a gun cleaning stick and pushed out the other 250 Jinhao nib sections as well. They were glued with only little glue and cam out easily. The gun cleaning stick has the advantage that its end is hollow so I did not damage the Jinhao feed at all. Maybe all Jinhao 250 are like that or just my 4. (I tried the same with my x750 and it would not go). Just be careful: The Jinhao cartridge feed is slightly broader than the standard Pelikan (Bock) feed. will be too wide to securely sit in a standard feed again. This is important for converters. (maybe the Bock nib is a tickle thicker) but in the end it worked. The 180 Bock nib is slimmer than the 160 which is too broad for the thin cap of the 8802. A Bock 60 nib should fit as well; they are all #5. I am waiting for a shipment of Jinhao 500, and eager to try my luck. I had to edit the number of the Bock triple I put into the Jinhao 250: it was a Bock 076. Edited by Brandywine, 17 November 2017 - 23:18. Thanks for the very detailed and helpful information, Brandywine! It's great to know which Bock nibs will fit in which pens. I think the 250 is an older model than the other popular ones, so that may explain the inferior gluing of the nib/feed assembly. Although the sections on my X750s gradually started leaking over time, I'm still not able to pop out the assembly as you did with the 250s. You're going to love the Jinhao 500. O yes, TruthPil, I do love the 500! and the colours are just gorgeous. and filled it with Waterman Mysterious Blue. Just wonderful! I tried in vain to push out the nib section again (that seems to be a unique feature of the 250ies). But the slim 180 nib fits well; the slightly broader 076 would be to broad for the pen to be capped. Now I've got more pens that take #5 nibs than those that take #6 nibs. It looks like I need to order more custom #5 nibs!! I also love the Knox OBB - and would really love the same in a fine - any candidates? Thanks for the concise list! You can add Jinhao 165 and 991 on there too. Edited by TruthPil, 10 April 2018 - 08:31.